Bonded DSL works by bonding up to 4 standard broadband lines together, creating a single virtual broadband connection to the internet for your business. It's the ideal solution if you are looking for a cost effective way to increase your speed or are unable to benefit from other solutions such as Fibre Broadband. 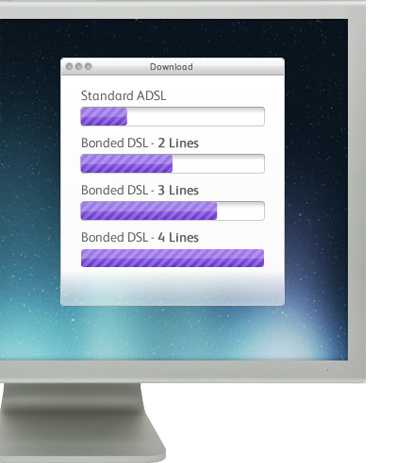 Bond's up to 4 standard ADSL lines! Our preconfigured routers effortlessly combine multiple broadband lines running to your business. As soon as these lines hit our aggregator, the bandwidth is combined - creating one high speed connection. This not only means faster speeds for your business but also the simplicity of managing your connection as if it were a single line. You require a router for each line that is bonded, these in turn are fed to an ethernet switch where you connect to your network. We don't cap your speed to that of the lowest performing line - with Bonded DSL, your lines are combined, giving you the actual speed of your lines together. Only a tiny part of your bandwidth is lost during this virtualisation process. As Bonded ADSL uses more than one line, it is more reliable than standard broadband, giving your business peace of mind. Should one router or line between you and the exchange fail, your connection will continue using the remaining lines. Bonded DSL is designed to give your business a cost effective alternative to Internet Leased Lines - an ideal solution for businesses that are unable to use services such Fibre Broadband because of location. Bonded DSL can be ordered and installed within 10 days - compared to the usual lead time of 72 days for an Internet Leased Line. Not only that but it's easy to install - allowing you to get on with running your business. Before ordering, you will need to have the lines installed into your property. These will need to be within the same area as the routers need to be connected together.